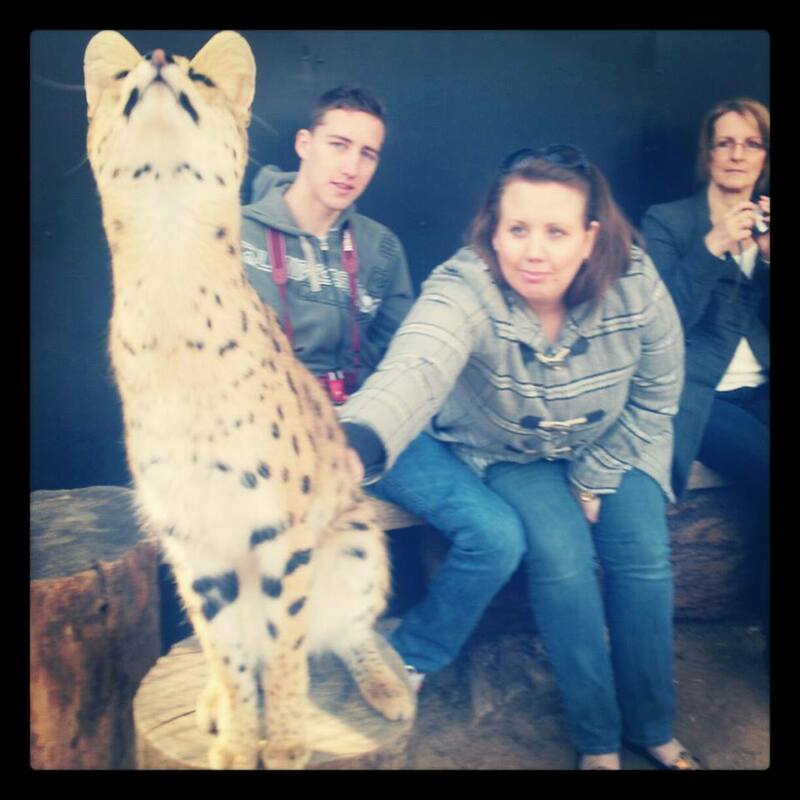 On Tuesday, we had the pleasure of attending the Werribee Zoo for an up close encounter from RedBalloon with the zoo’s three gorgeous Serval cats. 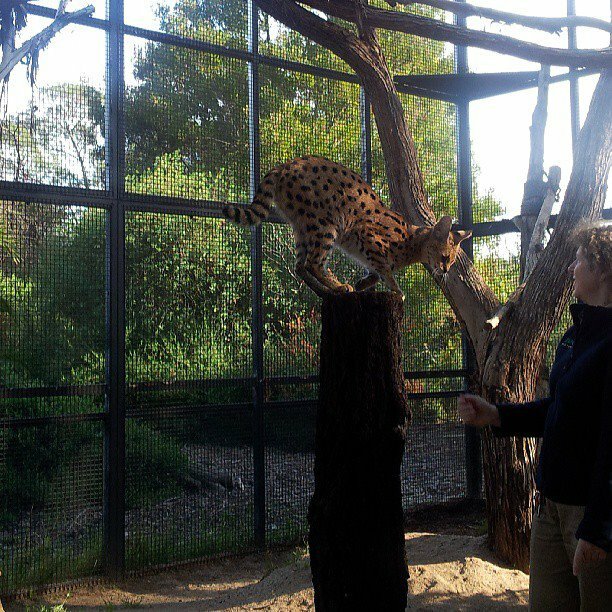 Our day started off getting to the Werribee Zoo just after 9am. It was a rather balmy 7 degrees when we got there, so we headed to the Meerkat cafe to get a warm drink and a croissant to warm us up. 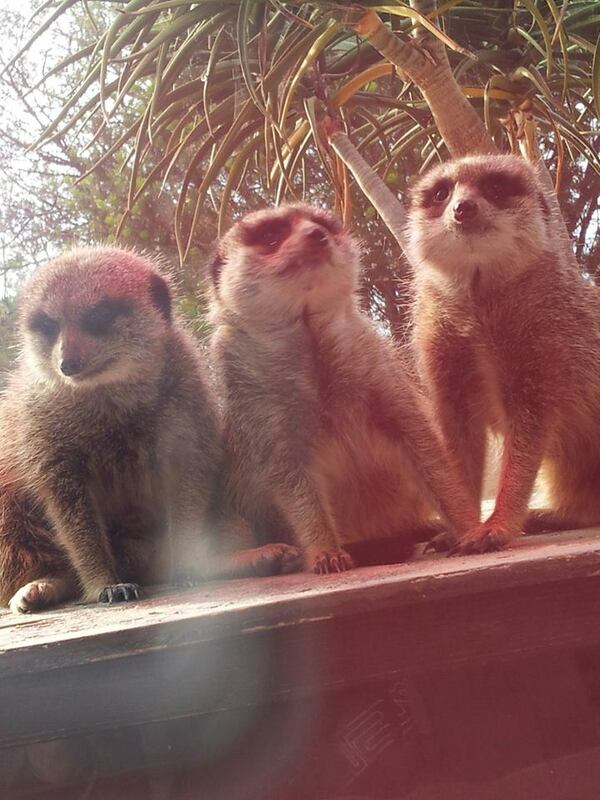 The cafe has huge glass windows that run along the length of the Meerkat enclosure. The little balls of cuteness were on top of a box, under a heat lamp and showing off (as they do). Meerkats! How cute are they? At 10 am, we headed toward the meeting spot where we were greeted by our lovely tour guide. 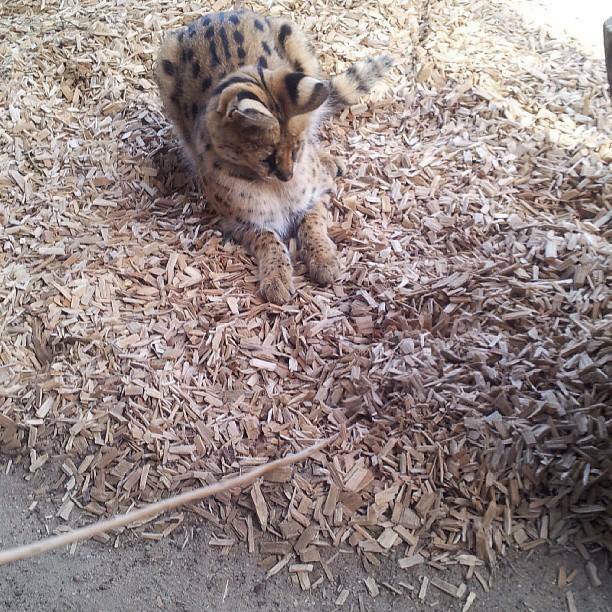 Once we got all of the formalities out of the way, we were ushered to the Serval training enclosure. 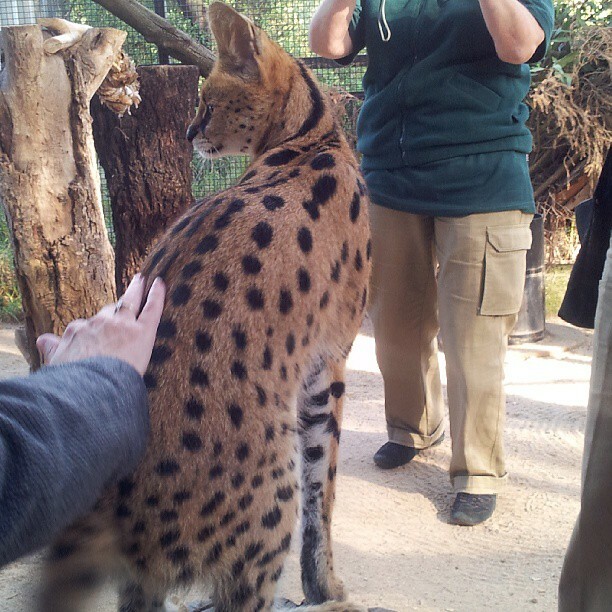 Groups for the Serval encounter are limited to six people, which makes the experience special for those who are involved and also benefits the Servals, as they are very timid animals. 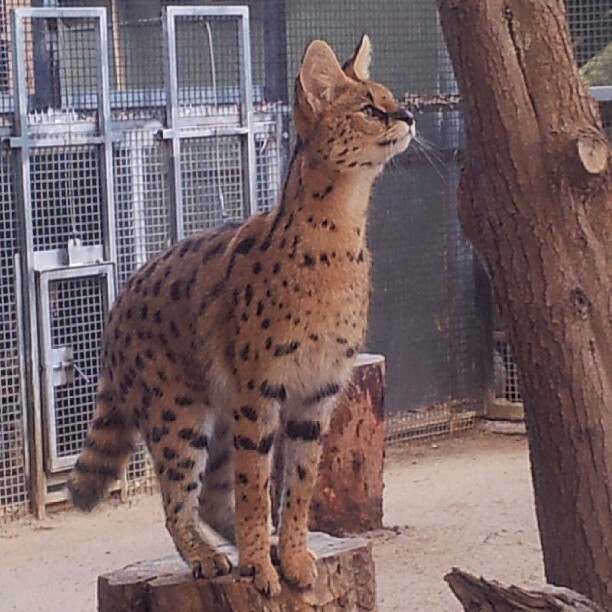 Werribee Zoo has three Serval sisters, Tula, Nanki and Morilli and they are possibly the cutest things imaginable. 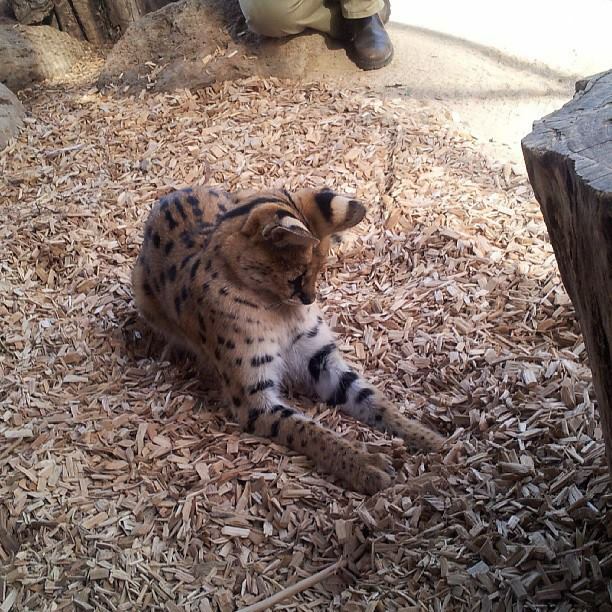 We are seated on a bench seat with three upright logs spaced evenly in front of us, we soon find out that the logs are for the Servals to jump onto so we can pat them. Yes, we got to pat them! 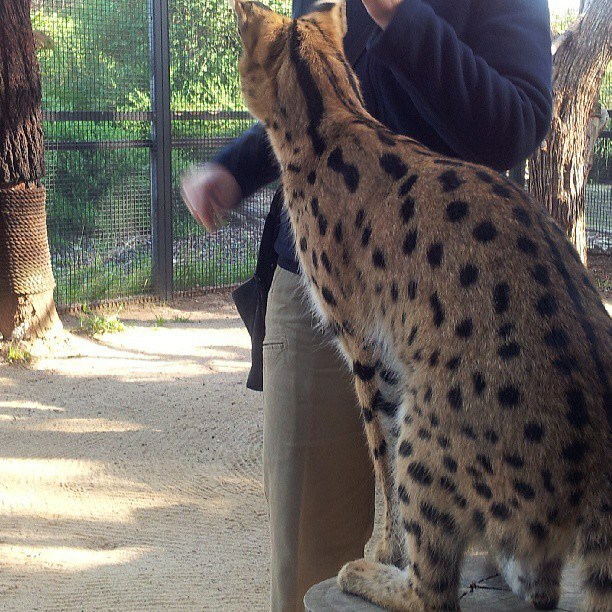 Yes, we could pet all three Servals and a few times each. They truly are gorgeous animals. My eldest son Josh and I. I think she liked how I was stroking her. 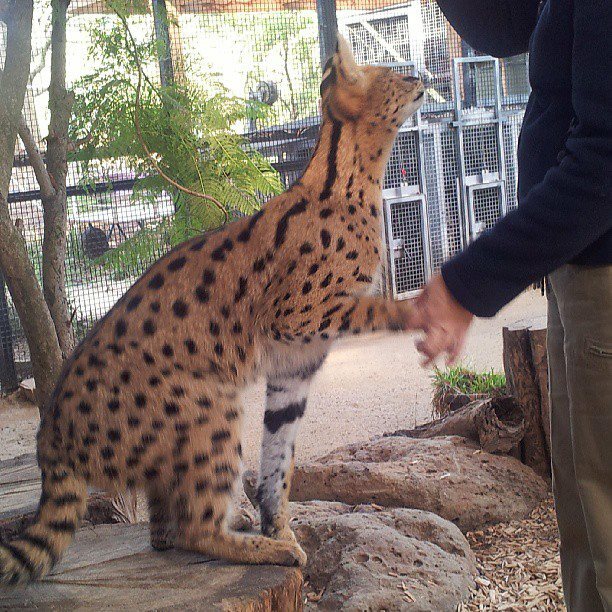 The Servals are trained for about an hour everyday, so they get used to their keepers who monitor their health and wellbeing during these training sessions. As well as teach the cats instincts they would need to use in the wild. For those not in the know, the Serval is a solitary cat found in much of Africa, from sub-Saharan Africa to the south-east. 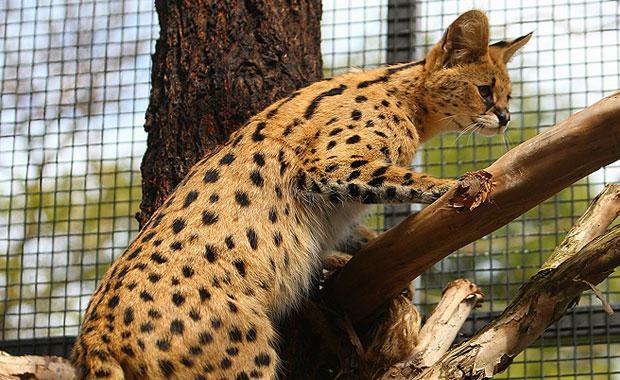 Servals are not endangered but are considered rare in many areas of their distribution, including the whole of South Africa. The ‘girls’ are rewarded with bits of meat and lick cream cheese from the keepers hand. The way the cats leap into the air and climb trees is amazing! Waiting for her cream cheese. Such beautiful markings on their coats and so soft! We got to play with them! We had a stick and played with them, pretending the stick was a mouse. It was so cute! This once in a lifetime experience was simply amazing. To be able to see such a beautiful animal from Africa and actually touch and play with it is one experience I will never forget in a hurry. The Encounter must be booked in advance and the encounter takes 60 mins, it includes Zoo admission and the safari bus tour. While you are at the zoo take the chance to walk around and see the Meerkats, Lions, Cheetahs Gorillas, Hippos, Vervet Monkeys, Wild African Dogs, as well as the Savannah animals from the Safari Bus including Rhinos, Giraffes, Zebras, Antelopes and Mongolian Horses. I am actually looking for another animal encounter, as it was so amazing. My birthday is coming up, so I’m hoping maybe I can receive a voucher as a gift (hint hint family!! )… maybe a lion or penguin encounter?!? Offer: Spend $129 or more on any RedBalloon experience, and receive $30 off. To redeem: Visit www.redballoon.com.au and enter the promotional code REDMUM07 at the checkout to receive your discount. * I was gifted the encounter as a review for RedBalloon as part of my role as a RedBalloon experience blogger and as per our disclosure policy.